CD 11/3/2018 R11 - HORSE RACING PREVIEW! Churchill Downs will host its final “Downs After Dark Presented by Stella Artois & Finlandia Vodka” of the Spring Meet on Friday night. Themed as “Rockin’ in the USA,” guests are encouraged to dress in a mix of denim and Americana for a night deemed ‘A Tribute to Rock and Roll” with a performance in the Plaza by the popular Juice Box Heroes. The final “Downs After Dark” also includes the popular text-to-win sweepstakes “Bet or No Bet,” sponsored by Thorntons. Four lucky on-track patrons will face a tough decision on Races 6-9: to place a $1,000 win bet on a horse in the upcoming race or take a $100 Thorntons’ gift card. Downs After Dark Events at Churchill: "Friday night’s theme for the next Downs After Dark Presented by Stella Artois and Finlandia Vodka is 'Summer Luau' where patrons are encouraged to wear casual Hawaiian-style prints. Admission gates will open each day at 4 p.m. and the first of 10 races will begin at 6 p.m. The final live race will be 10:57 p.m. The theme for the final Downs After Dark of the Spring Meet on Friday, June 27 is 'Rockin’ in the USA,' a pre-Fourth of July holiday celebration with denim, Americana and lots of red, white and blue." From Churchill: "June 13 marks the final edition of Friday Happy Hour at Churchill Downs, featuring live music and drink specials in the Plaza. Live music will be performed by Willow Creek and $2 Bud Lights and $3 Stella Artois will be available in the Plaza from 3-7 p.m. In addition to traditional grilled food items (burgers, hot dogs, brats) there will be a different specialty food item offered each week in the Plaza and guests also can register for box seats for the 2015 Kentucky Derby and Oaks." I always get a "Giggles" (as Mary says ) when i read the HRN faithful worry about the good of the game and its preservation. I laugh because it is evident that The racetrack management or even the horsemen in this case do not share your concerns. Today is a holiday ,based on the promotions that Churchill ran over the past week,i am sure they expected a good crowd today. Take a look at the 1rst race,to begin with it was only a 6 horse field(absolutely embarrasing). To add flavor to the mix,it was scratched down to a 2 horse field. This is definately fitting to the Abbott and Costello skit with 1 horse in the race.The one where the track announcers call began with "They are off in a bunch". Maybe CD does not really care,i am sure they have many other promotional goodies for all in attendance today. Everything but the main thing,Big fields to wager on. Sadly this is almost the norm Nationwide. I am not sure as to the scratches,and i am not criticizing the horsemen when they scratch. I am sure they are justified. Just don't want your cake and eat it to. This is a 5 Grand bottom of the barrel claimer. They are offering a purse of $17.000. The winners share is in the neighberhood of 10 Grand. Enough to cover expenses for 3 to 4 months,yet they can only get 6 to run and 4 of these guys want no part of the tracks generosity. To conclude,there are actually people who follow as fans that actually lose sleep over this. 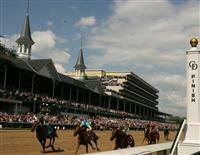 So I'm passing through Louisville tomorrow and thinking about stopping in for a few races at Churchill. Unfortunately, the card features a bunch of 5 and 6 horse fields. Pick 4s last week on similar cars paid less than 20.00. Can someone think of a good reason to stop? I am very surprised that nobody has mentioned him yet. His name is Masochistic , to the Cal Bred haters he may be your next nightmare. Excluding the quality of the race,this guy in todays 3rd race was probably the 2nd most impressive winner on the card. Victor Espinoza had the honor of riding them both. If you did not see the race,please go back to the replay of the race. Amino,something tells me that the bidding may start at 2 million. Trying to increase my bankroll for the derby any good picks for the first 5 races at Churchill? So glad to hear Larry Collmus is the new official track announcer at Churchill Downs! He did such a great job with the Triple Crown and he's way better than Mark Johnson! A reminder: Pool 1 of the Kentucky Derby Future Wager will be held Wednesday, Nov. 27 through Saturday, Nov. 30. The 23 individual wagering interests will be announced Monday (Nov. 25). The pool will open Nov. 27 at noon and close Nov. 30 prior to post time for either the Remsen at Aqueduct or Kentucky Jockey Club, whichever comes first.